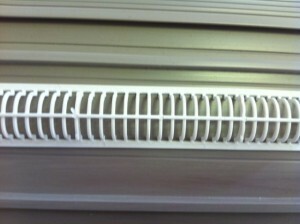 A customer challenged us to bond a Polypropylene (PP) vent to a piece of ridged PVC used in the building trade. Polypropylene is not the easiest of materials to bond, but this was made even harder because the ridged shape meant that not all of the material was making contact. This was a tough challenge, but we found the answer! SOLVED: We used a Tec 6100 glue gun loaded withTecbond 267/43 adhesive and left the material to set.We tested the product fully and found that it was a firmly bonded!